Relive the complete first season of ABC's Once Upon A Time, the hit series that boasts unforgettable characters and a tangled web of romance, action and enchantment. Immerse yourself in the magic and mystery of Storybrooke - a sleepy little town where every fairy-tale character you've ever known is frozen in time and trapped between two worlds, victims of an evil curse. On her 28th birthday, Emma Swan (Jennifer Morrison) meets Henry (Ja..
Relive every thrilling moment as ABC's Once Upon a Time: The Complete Second Season casts its tantalising spell. The curse is broken, magic has arrived, and there's no telling what - or who - will be unleashed! Now the exiled fairy-tale characters must grapple with a flood of awakened memories as they come to grips with their new "reality." Old loyalties will be tested, new heroes will emerge and vengeful villains will wreak havoc - inc..
Own Once Upon A Time Season 3 DVD from Deff, DVD, Blu-Ray & 4K Video Specialists - Free UK Delivery..
Love. As seductive and dangerous as magic, this potent, unpredictable force proves to be the ultimate weapon in the epic battle between good and evil in ABC Studios’ Once Upon a Time: The Complete Fourth Season. 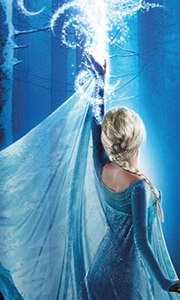 Soon after Emma and Hook unwittingly bring Elsa of Arendelle to Storybrooke, they encounter the mysterious Snow Queen, whose relentless obsession with both Emma and Elsa has chilling consequences. Meanwhile, it appears Regina ha..
Own Once Upon A Time Season 4 DVD from Deff, DVD, Blu-Ray & 4K Video Specialists - Free UK Delivery..
Darkness and Light. One conceals, the other reveals, but each is infinitely seductive. Prepare for the ultimate battle between these epic opposing forces in ABC Studios’ Once Upon a Time: The Complete Fifth Season. When the Saviour becomes the “Dark Swan,” the lines between good and evil blur as Emma begins to relish the intoxicating taste of absolute power. Terrified she’ll succumb, Emma and Hook visit Camelot to find the one person wh..
Brace yourself for a high-stakes, game-changing leap of tested faith, twisted fate and tantalising fantasy in ABC Studio's Once Upon A Time: The Complete Sixth Season. After Regina crushes the heart of her Dark Half, it appears Storybrooke will finally enjoy an era of tranquility. But this reprieve is short-lived when the Evil Queen reemerges and wreaks a level of havoc and terror that makes her previous cruelties pale by comparison. De..
Own Once Upon A Time Season 6 DVD from Deff, DVD, Blu-Ray & 4K Video Specialists - Free UK Delivery..
Own Once Upon A Time Season 7 DVD from Deff, DVD, Blu-Ray & 4K Video Specialists - Free UK Delivery..
Own Once Upon A Time Season Complete Season 1 to 7 Blu-Ray from Deff, DVD, Blu-Ray & 4K Video Specialists - Free UK Delivery..
Own Once Upon A Time Season Complete Season 1 to 7 DVD from Deff, DVD, Blu-Ray & 4K Video Specialists - Free UK Delivery..
Own Once Upon A Time Season 7 Blu-Ray from Deff, DVD, Blu-Ray & 4K Video Specialists - Free UK Delivery..
Own Once Upon A Time Seasons 1 to 6 DVD from Deff, DVD, Blu-Ray & 4K Video Specialists - Free UK Delivery..